MAXinBOX FC 0-10V VALVE Fan-coil controller for a 2-Pipe or 4-Pipe fan coil with 0-10 VDC valves and up to 4 fan speeds. Fan-coil controller for a 2-Pipe or 4-Pipe fan coil with 0-10 VDC valves and up to 4 fan speeds. Controller for one 2-pipe or 4-pipe fan coil unit with 0-10V valves. Its 4 16A C-load outputs can be used to control the fan speed or as individual outputs. It has thermostat function and 4 analog-digital multifunction inputs that can be configured as binary inputs for sensors and potential-free push buttons, as temperature probe inputs or as motion sensor inputs. 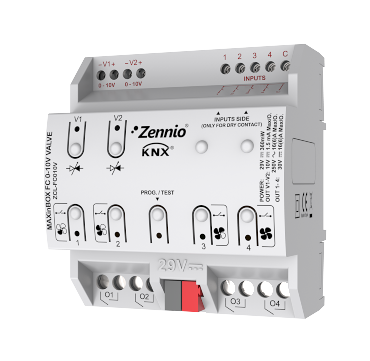 It includes a module with 10 logical functions and allows manual control of the outputs with status indication through LEDs.